"Oysters Gulfwide are kind of in a bad spot, but Louisiana is actually sort of the bright spot in terms of commercial production of oysters." The oyster dressing is safe this year. Since the Deepwater Horizon spill in 2010, 4 billion to 8.3 billion subtidal oysters were estimated to be lost across the Gulf coast. Many states are struggling. Louisiana is the only state producing at a level at or higher than before the spill, according to Seth Blitch, The Nature Conservancy's Director of Coastal and Marine Conservation in Louisiana. "Oysters Gulfwide are kind of in a bad spot, but Louisiana is actually sort of the bright spot in terms of commercial production of oysters. Louisiana produces more oysters than any other state in the country, which is good," Blitch said. 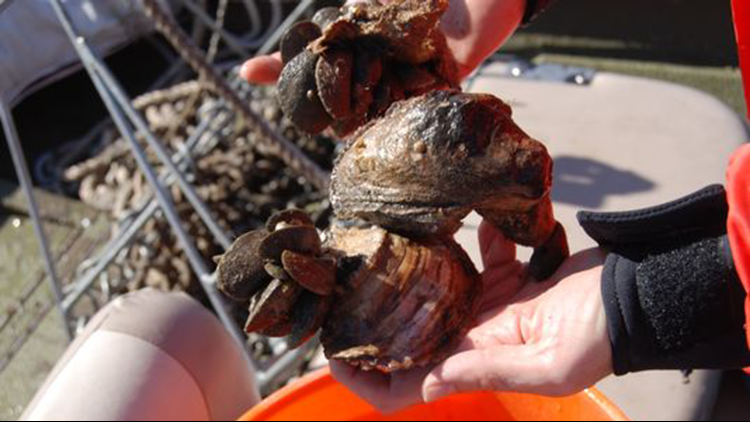 TNC recently released a report on oyster restoration in the Gulf. According to the report, there's been about a 50 percent to 85 percent oyster loss throughout the Gulf when compared to historic levels. The oyster industry pulls about $220 million to Texas, Louisiana, Mississippi, Alabama and Florida. The decrease could affect not only oyster harvesters but restaurants and industries that use the shell, such as using it to supplement chicken feed. Earlier in November, the state of Alabama announced there would be no oyster harvest in state waters because of a lack of supply. Scott Bannon, director of the Marine Resources Division of Alabama's conservancy agency, said a weeklong season in 2017 produced 136 sacks of oysters, according to an Associated Press report. In 2013, 7,000 sacks were harvested, Bannon said. "They felt like they couldn't open it and have any oysters survive," Blitch said. He pointed to Apalachicola Bay in the Florida panhandle, a bay that at one time produced 90 percent of Florida's oysters and about 10 percent of the nation's. "But it doesn't anymore," Blitch said. It's fallen on really hard times just in the last four or five years." Mississippi, he said, produced about 20,000 sacks of oysters last year. Fifteen years ago, the state produced almost half a million sacks in a season. 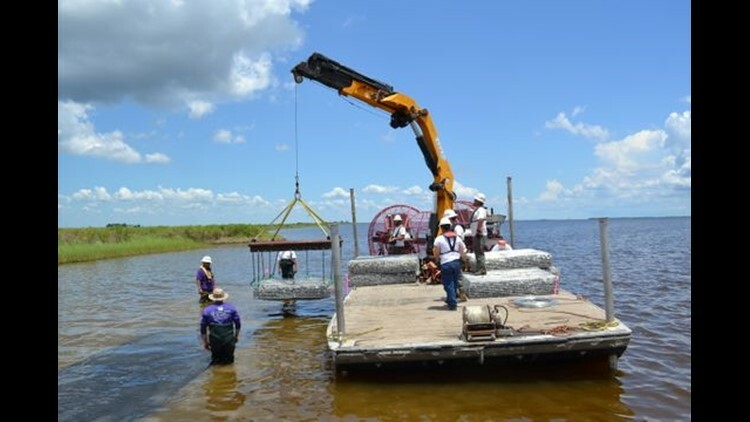 In Texas, TNC is launching two oyster reef restoration projects — a 60-acre reef restoration project in Copano Bay and one for a 50-acre reef in Galveston Bay. Half of each will be designated as a marine sanctuary, and the other half will be available for harvest and open for commercial fishing. "Louisiana is unique in that most of the oysters that we produce come off of private commercial leases, meaning individual or companies will lease submerged land — coastal lands — from the state and then they will actually, at their expense, put material on the bottom of that site," Blitch said. Oysters tend to live in estuaries that have a mix of salt and fresh water. Larvae oysters attach to cultch like rock or shell and develop until they're harvested. "Ideally, that's shell because oysters grow on each other. ... But shell is in short supply," Blitch said. Restaurants will put them in the landfill, and shucking houses sell it as part of chicken feed or other supply options. "There's an economic incentive to keep it and sell it." "Well over 90 percent of Louisiana's production comes from those leases. Even though there are public areas that you can harvest too, most of it comes off of leases," Blitch said. Blitch said there's a lot possible when reefs are valued for more than shell and meat. Oysters contribute to the habitat of other animals and protect landmasses from erosion. Oysters filter water to feed and help maintain and improve water quality. "Plus they're a delicious treat too, and they're the livelihood for a lot of people who harvest seafood," Blitch said. Polarized views can lead to thinking of oyster beds as either a habitat or a fishery, he said. "My view, and this report aims to suggest, that it shouldn't be an either/or situation. These things are linked, they're causally linked. We have sort of a mutual interest in having a really healthy oyster industry, seafood industry, but also valuing the habitat for these other things," he said. An integrated approach can benefit both. It can be difficult to manage oyster resources, but there are ways to work together to bring it back, Blitch said. Louisiana is in great shape of oysters as a fishery, but in terms of a habitat "less so," Blitch said. After the spill, about $160 million is available among the five states for specifically oyster restoration, he said. But there aren't many examples of what reefs looked like a century ago. That's true everywhere, he said. A variety of issues can contribute to population decline. On the Louisiana leases, people bring in material and grow reefs that look like they're growing, but they're harvested, so it's impermanent. It's not matter of pitting harvesting against restoration, Blitch said. The reefs are helping the habitat while they exist. "(Oysters) are a really good good proxy for what goes on in coastal systems because they're both a habitat and they're a fishery, and they're a good indicator of ecosystem health. For whatever reason, they just stir a ton of passion in people," Blitch said. One Louisiana lake stands as an example of what a reef not being harvested can do for the area around it. Sabine Lake on the Louisiana-Texas border hasn't been harvested commercially since 1966. There were water quality concerns related to point source pollution, Blitch said. Point source pollution is defined by the Clean Water Act as having a "discernible, confined and discrete conveyance," such as a pip, well or container. "Because oysters filter water, you can't pull oysters from water that has pollution problems and sell them to people to eat. So it was closed for a long time," Blitch said. A few years ago, the Food and Drug Administration deemed the water was clean now and the oysters were safe to eat, but it was still closed by law. About a million sacks of oysters were estimated to be in the Sabine Lake reef, "which is humongous," Blitch said. Some wanted to harvest it, and others pointed to the reef's asset as natural infrastructure. Oyster reefs build vertically and stick up out of the water, Blitch said. Because of that, they're a natural barrier against wave energy. The land adjacent to the reef showed less erosion than in other areas along the lake. It also acted as a physical barrier to water with more salt content and protected marsh plants. About a third of the reef is on the Texas side. That state sees the oyster reef as an asset for recreational fishing. Many of the record trout and redfish are caught on the reef, and they don't allow oyster harvesting. Earlier this year, the Louisiana Legislature banned all oyster harvest on the lake. There are different ways to do reef restoration, and they don't necessarily prohibit harvesting. The goals can work in concert, Blitch said. The Louisiana Department of Wildlife and Fisheries has reef management authority. They do "cultch planting," which involves putting cultch out for a reef to grow. In the eight years Blitch has lived in Louisiana, TNC has put out about six linear miles of reef projects. They include rebar cages filled with shell to precast concrete circles. Most recently, in Calcasieu Lake, TNC sank wire baskets filled with rock and shell in an area with coastal erosion. "If you put them in the right places, so many marine species reproduce by spawning, and those become part of the subplankton and then then they want to settle on something and attach to it and grow, like corals. Oysters are no different," he said. The right substrate in the right place is how the leases and reefs get managed. TNC wants their projects to keep acting as a reef. They don't necessarily want it to be harvested directly, but they're often near leases. The Calcasieu Lake project is in a public seed ground. "When we're successful at growing oysters, they're going to reproduce. And they're going to put their spat, or baby oysters, on areas that are immediately adjacent, where you can harvest, so that's sort of a linkage to the fishery where restoration can help the commercial side of oyster reefs," Blitch said.